UFC Fight Night 136 takes place tomorrow in Moscow, Russia. This is the first time that the organisation will hold an event in this country. Headlining this historic card are two heavyweight veterans in Mark Hunt and Aleksei Oleinik. Both men know that a win here in a main-event could propel them to within touching reach of a title-eliminator, even at the late stages of their respective careers. The co-main event sees Poland's Jan Blachowicz take on Ukrainian Nikita Krylov, in the latter's return to the UFC. Also featuring on the card is Andrei Arlovski. The former heavyweight champion meets home-native Shamil Abdurakhimov. The featured bout of the prelims will be contested between Khalid Murtazaliev and CB Dolloway. We are going to be going through the whole card and giving our predicted outcomes. Kicking off the show are two bantamweights, Merab Dvalishvili and Terrion Ware go head-to-head. Both fighters come into this one riding losing streaks and neither man has managed a victory in the UFC as of yet. Dvalishvili losing his first two outings with the organisation and Ware, his first three. This is a huge match-up for the two fighters personally as another defeat could result in a possible release from the company. I see this being a cagey affair given what may be on the line with Dvalishvili mainly controlling the action and earning a comfortable unanimous decision victory. I foresee Ware later being released from the UFC. Next up is a welterweight clash between Ramazan Emeev and Stefan Sekulic. Emeev comes into this one, winning his previoius 6 contests. Sekulic is making his UFC debut. I think Sekulic will find the step up in competition too much on this occasion and I think Emeev will get a late stoppage win by way of knockout in the 3rd and final round, extending his winning streak to 7. Third on the bill sees two undefeated fighters square off in the form of Adam Yandiev and Jordan Johnson. Both fighters boast an impressive 9-0 record but somebody's 0 has got to go. This is Yandiev's UFC debut and Johnson's middleweight debut, coming down from light-heavyweight. Again, I feel like the step up in competition is going to be a little bit too much for the UFC debutant. Though I see a very competitive match-up, I am going to give the edge to Johnson to claim the decision victory. I wouldn't be surprised if it was split between the judges. After that is a match-up in the light-heavyweight division between Magomed Ankalaev and Marcin Prachnio. Both fighters come into this one on the back of defeats after having their 8-fight win-streaks snapped. Both men are looking to pick up their first win with the company and I think it will be Ankalaev that will be the one to get it and get it early. I predict a first round knockout victory for the Russian. Back-to-back defeats for the Pole. Mairbek Taisumov takes on Desmond Green next in a lightweight contest. Taisumov comes into this one on the back of 5 consecutive victories and I expect that to continue against 'The Predator'. 'Beckan' has finished all but one of his opponents and I'm gonna predict he finishes Green too. I'm gonna say he submits him with a rear-naked choke in the very first round, extending his win-streak to 6. Next up is Rustam Khabilov versus Kajan Johnson, again in the lightweight division. Khabilov also comes into this one, like Taisumov, winning his previous 5 outings, most recently defeating Taisumov's opponent, Desmond Green. Whereas Johnson comes into the bout on the back of a defeat at the hands of Islam Makhachev. I think the form-book will continue here with Khabilov picking up the victory and very comfortably so. I predict 3 very long rounds for Johnson and the Russian securing a landslide unanimous decision victory. After that, Petr Yan will face off against South Korea's Jin Soon Son in the bantamweight division. Both fighters are riding 4-fight win streaks. The South Korean is making his UFC debut and once again I feel like the step up is going to be too much. I do however feel it will go the distance. I predict the Russian to earn a relatively convincing unanimous victory to extend his winning streak to 5 and end Son's. As mentioned earlier, the featured bout of the prelims involves Khalid Murtazaliev and CB Dolloway in the middleweight division. Both fighters come into this one victorious in their last two contests. I think this is where Murtazaliev announces himself to the MMA world by knocking out the veteran, Dolloway in the very first round. I also foresee a potential retirement announcement after the fight from 'The Doberman'. Kicking off the main card is the undefeated Russian, Alexey Kunchenko. The home-native holds an incredible 18-0 record but faces undoubtedly his toughest test yet in the Brazilian warhorse, Thiago Alves, in what is the Russians UFC debut. However, this time I am backing the newcomer. Kunchenko has looked unstoppable fighting with M-1 and I expect that dominance to continue against an aging 'Pitbull'. I anticipate an all-out war in what could well be awarded the fight of the night which sees Kunchenko knocking out Alves late in the second round. Could we see a star be born? The action does not stop there, from one pit bull to another, Andrei Arlovski is next to take to the octagon. He faces Russian, Shamil Abdurakhimov. This is a very tough one to call but I'm going to give the edge to Abdurakhimov. I'm going to predict the Russian gets a late knockout victory. Huge for his career. I also foresee another retirement, this time for the legend, Andrei Arlovski. It's co-main event time. Jan Blachowicz versus Nikita Krylov. The Polish fighter is on a surge right now, victory in each of his last 3 contests has seen him rise to 4th in the light-heavyweight rankings. He is in touching reach of a title-shot and victory here would be instrumental for him. His opponent, Krylov, however, is also on a tear. The Ukrainian has won his last 4 outings, earning him a place back in the UFC. Victory for Krylov would surely place him in the top 5 in the rankings, so this fight is huge for both fighters. Again, this is a very close match-up but I'm going to tilt in the favor of returning, Krylov. I feel he is a man with something to prove and I believe he will do so at Blachowicz's expense. All of the Ukrainians' 24 victories have come by way of stoppage and I think that will continue. I predict a very late submission victory with a rear-naked choke. The big one. 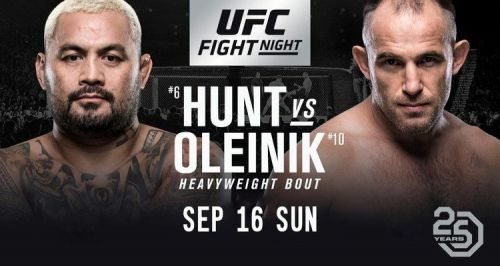 The main-event, Mark Hunt versus Aleksei Oleinik. These two veterans are in their 40's but are showing no let-up. Both fighters are still looking to make their way up the heavyweight rankings, and a win here will do absolutely no harm in that quest. It is scheduled for 5 rounds but I don't see those being required. Not when walk-off, knockout artist, Mark Hunt is involved. And that is exactly what I envisage. I predict 'The Super Samoan' to land his signature walk-off knockout and land it early. I'm going for the first round knockout for the New Zealander. What are you predictions for this historic night? Let us know.